2 May 2008, at 3:04p.m. UK - With the number of weeks to the Great Yorkshire Show now into single figures, livestock entries already received make it clear that one of the country’s premier farming events, the Great Yorkshire Show, will again combine quality with quantity in the show rings. Count Down to the Great Yorkshire Show UK - With the number of weeks to the Great Yorkshire Show now into single figures, livestock entries already received make it clear that one of the country’s premier farming events, the Great Yorkshire Show, will again combine quality with quantity in the show rings. The farming showcase runs from Tuesday 8 – Thursday 10 July at the Great Yorkshire Showground, Harrogate. This year will be the 150th show. 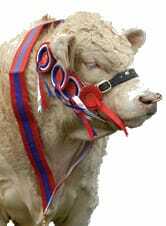 Bill Cowling, Honorary Show Director said: “In my view you can judge a show by the number and standard of its livestock. We have built our reputation on the support of farmers in bringing some of the finest animals in the country to compete, and in great numbers.” Last year there were a total of 1,119 cattle, 1,738 sheep and 357 pigs entered in the competitive classes. “We appreciate the support we get from the farming community, and despite the traumas of Bluetongue, entries are coming in fast so we are on track to maintain our reputation,” he added. At present the showground stands within a restricted zone but to allow as much flexibility as possible, the show organisers, the Yorkshire Agricultural Society, have suggested that farmers enter their stock whether they are within or outside the restricted zone. All entry details will be catalogued but livestock entry fees will not be cashed until it is known whether or not the animals can be shown at Harrogate. To mark the 150th Show, a new cattle competition has been introduced, the Blythewood Dairy Pairs and the Blythewood Beef Pairs which will be judged in the Main Ring with a presentation ceremony to follow. “The aim is to find the best matching pair from each breed, and then the winning pair from beef and from dairy will be chosen as the Champions,” explained Mr Cowling. “This will be judged in the Main Ring at the same time as the Grand Parade of Cattle on the Wednesday afternoon. I am sure this will be absolutely splendid, a real occasion, and underlines our commitment to keeping the Great Yorkshire a show with agriculture at its heart.” Prize money has been set at £500 each for the Dairy and Beef Champions. Mr Archie McGregor of Kilsyth, North Lanarkshire has the difficult task of judging the Blythewood beef champion pair, whilst Mr Meurig James of Whitland, Carmarthenshire will be deciding the winners in the dairy. Also new for this year is the Young Handlers competition for Beef animals. “We’ve had classes for young handlers in other sections – dairy, pigs and sheep – for a number of years and they have been very successful. It’s vital that we encourage the younger generation to show stock, and I am sure this will prove just as popular,” said Mr Cowling. Linking the farmer with the consumer is a key aim of the Great Yorkshire Show, and the Housewife’s Choice Cattle competition does just that. Members of the public are invited to “judge” a cattle line up, whilst the commentator explains the difference and uses of the breeds in the ring. The Sheep Show continues to grow in popularity with more than 30 breeds represented, plus the Commercial Carcases, Butchers’ Lambs, Interbreed and Terminal Sire classes. Wool on the Hoof will again be a feature on Thursday, judged this year by Mr Malcolm Hudson of Shipley, West Yorkshire. There are seven breed groups within the Wool on the Hoof competition, each dedicated to sheep breeds that have a specific type of wool. The winner of each group goes forward for a final assessment to secure the overall championship title. The competition become increasingly popular with visitors who are able to learn about the many variations in wool types carried by the UK’s wide range of sheep breeds. Pig entry numbers have been steadily growing over the last decade and last year stood at 357. The BPA Pig of the Year Final will again take place at the Great Yorkshire and will be judged on the Wednesday morning by Mr Jim Appleton of Ormskirk, Lancashire. “We are delighted that Lord Salisbury will be at the show to present the Salver to the winner,” said Mr Cowling. To mark the 150th Show all competitors in every class – from rabbits to show jumping and honey to cattle - will receive a commemorative plaque engraved with the Society’s crest and recording the anniversary. For more information on the Great Yorkshire Show click here.